Harmful Algal Bloom Causes Big Losses at Marine Harvest Salmon Farm - 30 September 2014, CANADA - Marine Harvest Canada (MHC) is estimating a loss of up to 280,000 fish of an average weight of 4.1 kilograms due to a harmful plankton bloom at Marsh Bay near Port Hardy, BC. Harmful plankton bloom reported at Marine Harvest Canada salmon farm: The harmful algae, Heterosigma akashiwo, are common plankton known to kill salmon. Originally reported on MHC's website on May 27, the company's salmon farms have been on high alert for harmful plankton all summer. "We've had over three months of sunny days, and have watched the plankton grow in many of our operating areas over this time," said James Gaskill, Production Director. "Our mitigation systems, which include tarps and aeration, have worked very well in all other regions but just couldn't overcome this extreme and rare bloom." A recent change in weather has reduced concern of further blooms, and mortality has ceased at Marsh Bay. The company maintains insurance to cover this type of rare event. MHC is British Columbia's leading salmon aquaculture company, producing 40,000 tonnes of fresh, farm-raised salmon at sites on and around Vancouver Island. Algal bloom at Lake Erie, as viewed from the International Space Station. Recent NASA report: "The accumulation of algae in lakes has become so bad - NASA is using a special sensor on the International Space Station to monitor it from space", writes The Daily Mail. The space agency has already released a stunning series of images showing the effect algae can have on Earth's lakes. 'If you've been watching recent news of algal bloom concerns in Lake Erie, you know that the right conditions for algae can lead to contamination of local water sources, potentially impacting aquatic life and humans,' NASA said in a statement. The International Space Station's Hyperspectral Imager for the Coastal Ocean (HICO) was mounted to the exterior of the orbiting laboratory. This imager provides a way for researchers to see 90 wavelengths of light not visible to the human eye, writes The Daily mail. It can help researchers on Earth monitor harmful algal blooms (HABs) because they, along with other organic materials, have a 'spectral signature.' The biological matter emits a unique wavelength as it absorbs and scatters solar energy, resulting in fluorescence and backscattering. The light reflects back to HICO, which reads the data like a fingerprint. Researchers can then use the information from HICO to 'see' what they're missing with their own senses - and use it to study biological and chemical signatures for aquatic and terrestrial materials. This can reveal the presence of microscopic plants, organic compounds, suspended sediments and other factors controlling water quality. 'Historically, blooms have been visually observed by the naked eye due to the discoloration of the water,' Ruhul Amin, Ph.D., principal investigator for the HICO CASIS-NRL project, said in a statement. 'Now optical sensors can detect these changes in the color of the water and quantitatively measure the spectral radiance changes due to algae blooms.' In the Lake Erie area researchers are looking at phytoplankton and algal blooms that occur regularly in summer months, often in the harmful quantities found this year. 'Unlike conventional multi-spectral images, the high spatial and spectral resolution afforded by HICO enables us to develop new approaches to more fully utilize hyperspectral data to distinguish HAB species from space,' Amin said in a statement. 'Conventional multi-spectral ocean color imagery in general does not contain sufficient information to discriminate between bloom species, but HICO's contiguous bands collect information that can enable us to identify the species.' Researchers at the NRL-SSC have used HICO's ability to show visible and near infrared wavelengths to follow the Lake Erie blooms for years. The stunning, unexpected colors of Antarctica: The colors are attributable to different natural processes. 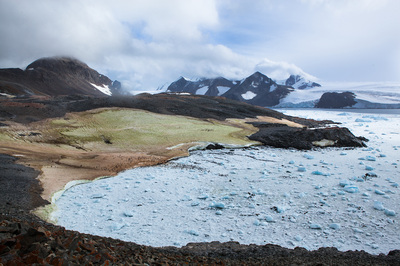 The browns are sediments, dirt released by annual thaw and carried across the surface of the ice by wind, meltwater, or creatures’ feet. Around the main penguin colony areas, the browns give way to pink. That’s down to diet and the call of nature. 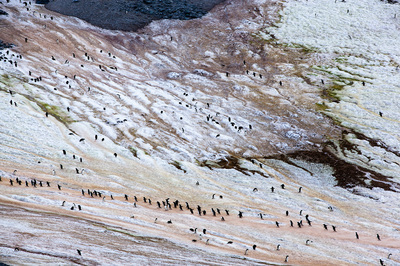 “Penguins eat a lot of krill,” says Lacombe. “Krill goes in pink when eaten, and comes out of the other side pink too.” ....The emergent reds were the greatest surprise to Lacombe. Microscopic red algae (Chlamydomonas nivalis) exist dormant-like in the snow and ice of Antarctica, until they’re activated by seasonal rises in temperature. The triggered algae bloom can glow entire vistas red, and even green. Off the coast of southwest Africa, ocean currents, winds, and the underwater shelf interact to create compelling biology and chemistry. Plant-like phytoplankton often bloom in the nutrient-rich surface waters, while bacteria on the seafloor consume decaying plant and animal matter and occasionally release gas that bubbles to the surface. Just off the coast of Namibia, the Benguela Current flows along the ocean surface. It moves north and west along the coast from South Africa and is enriched by iron and other nutrients from the Southern Ocean and from dust blowing off African coastal deserts. Easterly winds push surface waters offshore and promote upwelling near the coast, which brings up cold, nutrient-rich waters from the deeper ocean. These interactions can make the ocean come alive with color. Near the shore, yellow-green features in the water suggest the presence of sulfur. Studies have described how bacteria in oxygen-depleted bottom waters consume organic matter and produce prodigious amounts of hydrogen sulfide. As that gas bubbles up into more oxygen-rich water, the sulfur precipitates out and floats near the surface. It can give off a potent rotten-egg smell and pose a toxic threat to fish. Further offshore, milky green water may be a bloom of one or several species of phytoplankton. As countless microscopic, plant-like organisms consume sunlight and nutrients, they also consume oxygen. Oxygen depletion can sometimes become so complete that it creates a “dead zone” that can suffocate other marine species. At the same time, the oxygen-depleted waters help sulfur-producing bacteria to thrive. Brüchert, V., Currie, B., Peard, K.R. (2009) Hydrogen sulphide and methane emissions on the central Namibian shelf. Progress in Oceanography 83, 169–179. NASA (2014) Ocean Color Web. Accessed April 29, 2014. NASA Earth Observatory (2010, August 10) Phytoplankton Bloom off Namibia. NASA Earth Observatory (2007, November 22) Phytoplankton Bloom off Namibia. University of Miami (2013) Ocean Surface Currents: The Benguela Current. Accessed April 29, 2014. When the winds of winter sweep across West Africa, temperatures drop and skies turn yellow. Prevalent from November to March, the harmattan is a desert wind that blows across the Sahara Desert from the northeast or the east, usually as a result of a high pressure system over the northwestern Sahara. Harmattan winds pick up dust and darken skies. A harmattan dust storm was blowing on February 28, 2014, when the Moderate Resolution Imaging Spectroradiometer (MODIS) on NASA’s Terra satellite acquired this image. 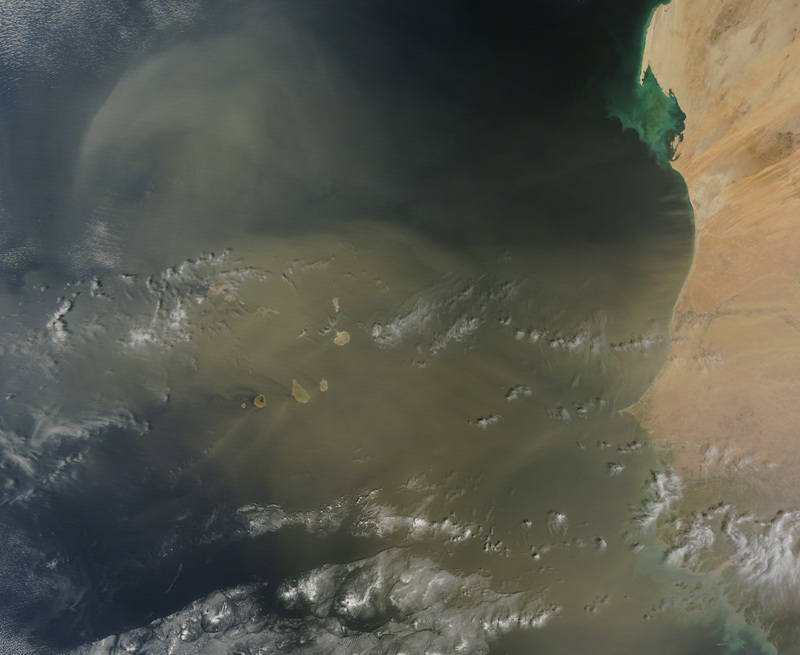 The yellow dust was concentrated largely over the Cape Verde Islands, where the mountain topography created swirling eddies and triangular wakes in the dust cloud. West Africa frames the right edge of the image, and distinct plumes of dust moved west from Senegal and Mauritania. The dust storm had a long reach. By March 4, a faint yellow haze lingered over the Caribbean. The storm is not unusual in its reach. Hundreds of millions of tons of dust blow out of Africa every year, reaching the Atlantic, Caribbean, and Gulf of Mexico. The dust fertilizes ocean waters, feeding plankton growth, but it may also carry fungus and disease-causing microorganisms that damage coral reefs. On land, the dust is a health hazard when inhaled, and it has been found to carry chemical contaminants, including pesticides. ﻿On January 19, 2014, the Moderate Resolution Imaging Spectroradiometer (MODIS) on NASA’s Aqua satellite captured this image of a bloom of microscopic organisms off the southeastern coast of Brazil. Note how the waters of the South Atlantic are darkened in patches stretching as much as 800 kilometers (500 miles) from south to northeast across the continental shelf. In the image, the puffy strands of white over the sea and inland are clouds. 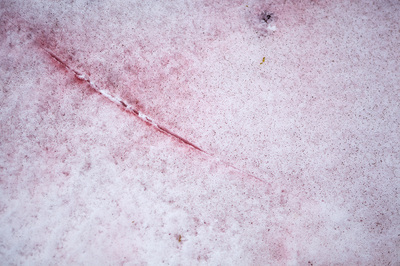 Biologists working in the area have identified the bloom as Myrionecta rubra (previously known as Mesodinium rubrum), a fast-swimming ciliate protist. Though it is not a true phytoplankter, it is an autotroph; that is, it makes its own food. Myrionecta fuels itself by photosynthesis, but it does so by ingesting chloroplasts (chlorophyll-bearing plastids) from other algae. Aside from threatening the microscopic algae it consumes, Myrionecta rubra is not known to be toxic to other marine life or humans. 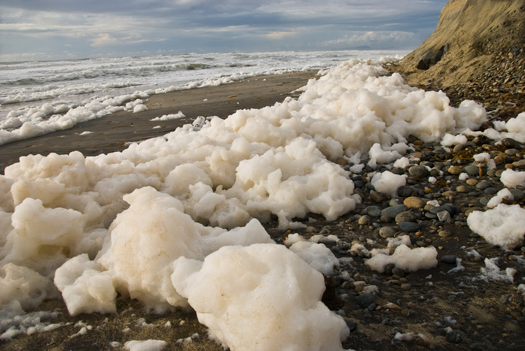 According to a 2011 paper by several scientists called "Foam in the Aquatic Environment," in order for foam to form, you need air, water, and a key third ingredient called a "surfactant" - a kind of sticky molecule that clings to the surface between water and air. This surfactant ingredient can come from a lot of places; human-made sources include fertilizers, detergents, paper factories, leather tanneries, and sewage. But surfactants also come from the proteins and fats in algae, seaweed, and other marine plant life. There are lots of different molecules that can act as surfactants, but they all have one thing in common: one end of the molecule is hydrophilic (attracted to water) while the other end is hydrophobic (repelled by water). When a bunch of surfactant molecules get mixed together with plenty of water and air, they all want to line themselves up right at the boundary, with one end (hydrophilc) facing the water and the other (hydrophobic) facing the air. They'll even line up back to back, so that the hydrophilic ends are pointed at each other, with a thin layer of water in between. That thin layer of water takes the shape of a sphere, because a sphere requires the least energy of any shape, and voila, it's a bubble. Under certain conditions, Emiliania huxleyi can form massive blooms which can be detected by satellite remote sensing. What looks like white clouds in the water, is in fact the reflected light from billions of coccoliths floating in the water-column. Landsat image from 24th July 1999, courtesy of Steve Groom, Plymouth Marine Laboratory. This bloom attracted considerable coverage in the UK media. Source: Plymouth Marine Laboratory - http://www.pml.ac.uk/.